This week we head back to late October, 2012, for an example of how your PopCulteer and humble Radio Free Charleston host can make something out of nothing. For reasons I don’t exactly recall, we did a special best-of Pre-Halloween episode in 2012. I assembled “Skull Shirt,” a one- hour-five-minute compilation show that presented highlights from the first five years worth of Radio Free Charleston Halloween specials. We returned with an all-new show the next week, with one largely recorded at the very first ShockaCon. Representing our first Halloween special, music-wise, we had half of The Pistol Whippers, Brian Holstine and Bobby Peyton, performing an acoustic version of a classic Whippers punk tune that I keep forgetting the title of. This was one of the highlights of episode eight. Over the end credits of this compilation, you will hear Whistlepunk with “Vampire Love Song.” Whistlepunk was the very first band we had on Radio Free Charleston and this song from episode seven was actually recorded during the same sessions as their song on our first show. Speaking of Whistlepunk, in 2007, just in time for RFC 29, the now-five-member Whistlepunk hosted a Halloween party at Capitol Roasters and we brazenly hijacked it. You’ll see a few clips from the party, with some costumed party-goers, and you will also see the music video for “Horror Movie Gangster” by Lil Guy from South Park Enterprises. This was the first rap video on Radio Free Charleston and also the first video that was edited, mixed, and finished after the host segments of the show were done. 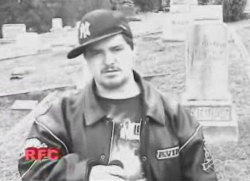 It’s also a great song and a fun video shot in grainy black and white at Spring Hill Cemetary. In 2008, we were so filled with the Halloween spirit that our two part Halloween special (RFC 54 and 55) grew a third appendage (RFC 64) which didn’t show up until April Fools Day the following year. These three episodes together comprise Radio Free Charleston Horror Theatre and include appearances (mostly in zombie form) by Kitty Killton, Liz McCormick, Brian Young, Melanie Larch, Alan Young, Stephen Beckner, and Mark Beckner. I became “Count Rudolph.” These episodes were loads of fun and feature the most extensive use of green screen technology in the history of Radio Free Charleston. This episode offers up two musical treats from these jam-packed shows. 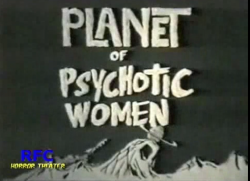 First we have “Planet Of The Psychotic Women,” a great lost Go Van Gogh music video which combined footage shot by Stephen Beckner in 1991 with a vintage live performance of the band shot by yours truly, also assembled and edited by yours truly in 2008. After that, we had Hellblinki (also known as The Hellblinki Sextet) with “Don’t Go Down To The Woods,” a live performance recorded at The Blue Parrot. Representing RFC 85, we have two memorable performances. First, Unknown Hinson, with “Silver Platter,” recorded live at The Sound Factory. The Kang of Country Western Troubadours was in vintage form, and getting him for the show was a major coup. This compilation also features a very cool video by Flare Baroshi, “Vampire Mafia,” co-directed by Flare Baroshi and yours truly, and filmed on the two abandoned floors of desolation above LiveMix Studio. 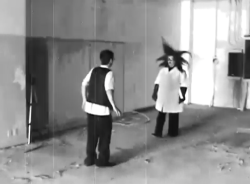 The original plan for 2010 was to produce an entire movie and post it as our Halloween show. That didn’t happen and “Jazz From Hell” remains our unfinished epic. For this show, I included the trailer for “Jazz From Hell” so you can see that it’s pretty much your everyday, run of the mill mad scientist-creates-pot-that-turns-people-into-zombie-jazz-musicians. 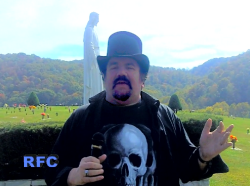 Our host segments for this “best of” show were shot at a cemetary which shall remain nameless. Our title shirt was on sale at Penney’s, I think. I can’t really remember. Oh, since the orignal shows were in the standard aspect ration, we dumped the widescreen for this episode.